It’s time to raise the bar on the good ol’ tuna sandwich. Boost flavor with lemon juice and Dijon. Seasonal veggies in the mix do double-duty - taste and color! Try this tasty recipe for Tuna-Veggie Picnic Sandwiches, which are not only packed with grains but are also under 500 calories. In a small bowl, mix together tuna, mayonnaise, Dijon mustard, lemon juice, and salt and pepper to taste. Stir in carrots, red bell peppers, and celery. Place 6 torn leaves of romaine lettuce on half of the slices of OROWEAT Double Fiber Bread. Spoon tuna mixture on top of the lettuce slices. 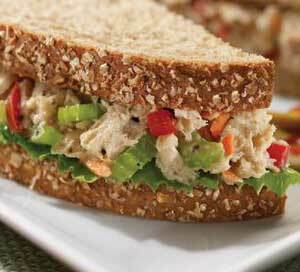 Place another torn lettuce slice on each tuna sandwich and cover with another slice of OROWEAT Double Fiber Bread. Wrap sandwiches in colorful plastic wrap or wax paper and keep chilled. Your sandwiches are now picnic ready!